- Made by pet safe materials, 100% safe and non-toxic. - A few hours of mental stimulation and a solid physical game will benefit your birds. - Give your pet birds a treat and have hours of fun watching them play, fits most cages, steel hook connects to cage easily. - The rope swing provides a firm perch made from a woven cable of soft cotton. Designed to soothe your bird's feet while affording fun exercise opportunities. - Provides pet birds a fun elevated place to swing, chew, climb, suitable for small parakeets, budgie, cockatiels, conures, macaws, parrots, love birds, finches ect. 1.All of the parrot /birds toys made in natural food coloring and material. 2.Color for edible pigment to ensure the pet physical and mental health. LARGE SIZE FOR MOST BIRD - Handmade bird rope perch,L11.4" x W9.85"
STURDY AND COLORFUL - Bird/Parrot rope perch made of 100% non-toxic tightly woven cotton and inner steel wire,designed to sooth your birdfs tender talonfs without the dangers of wires or stiffeners. CHANGEABLE SHAPE-Bird rope toys can be change the shape into triangle or any others,not only for perch but also for birds to climbing. EASY TO USE - An ideal bird rope toys designed for your little friends to play and climb, easy install in the cage. 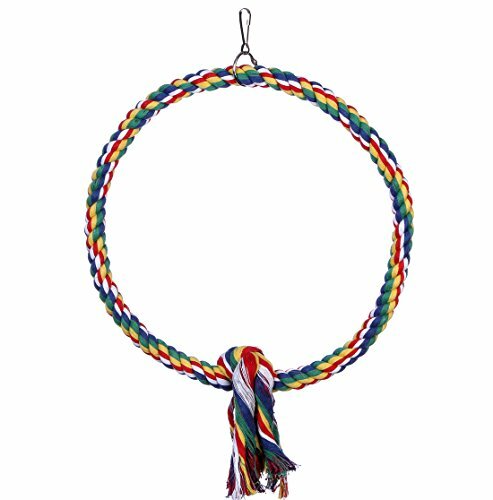 Bird Rope Perch bungees promote exercise and help to develop coordination and balance skills.Perfect chew toys for medium size birds and parrots. If you have any questions about this product by DETOP, contact us by completing and submitting the form below. If you are looking for a specif part number, please include it with your message.